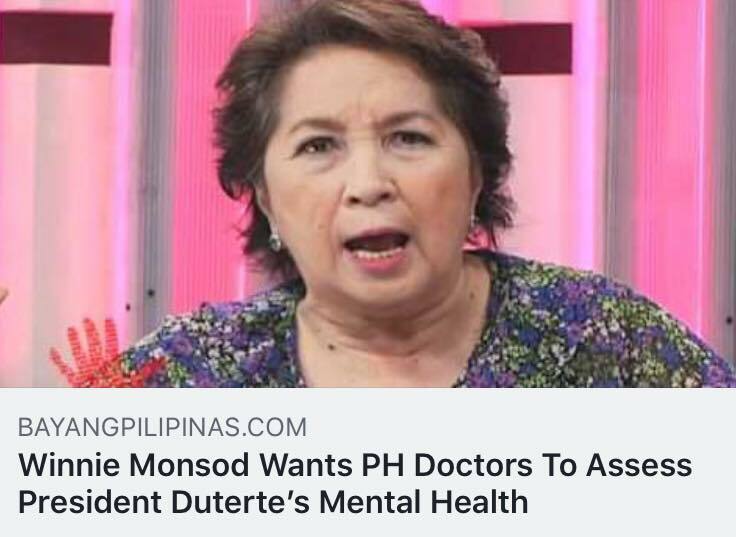 Veteran Media personality Jay Sonza took to social media and shared his sentiment over the recent behavior of former colleague Solita “Winnie” Monsod amid her suggestion that president Duterte’s mental health should be assessed by doctors. 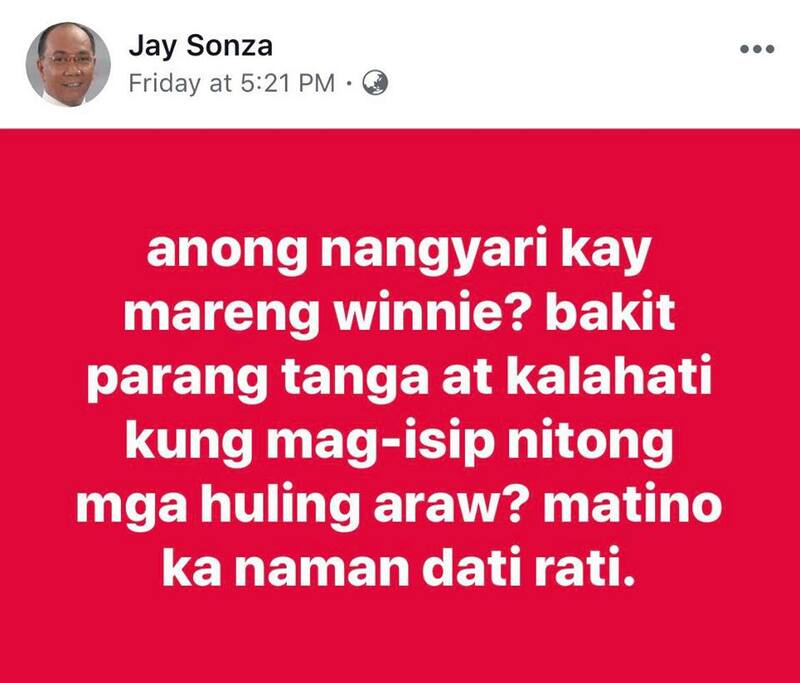 In a post he shared on Facebook, former TV show host and newscaster Jay Sonza questioned the recent behavior of his former colleague and fellow veteran newscaster and journalist Solita “Mareng Winnie” Monsod. This is in connection with the request made by Monsod that President Duterte be subjected to a mental health assessment. Sonza bared that his friend Monsod is acting quite weird lately, and mused that she was never like that in the past. Netizens bared several reasons on why Winnie Monsod was acting the way she has been recently. One netizen said that it might be a case of dementia creeping up on her, since she is not getting any younger. Others say that it is quite clear that she is biased on her opinions and clearly favors the yellows. Yet another netizen says that because of her affiliation with the Aquinos, she made it her life mission to criticize all leaders who are against the Aquinos. Netizen Benjie Daisy Contreras posted on Facebook that Winnie Monsod and her husband are true blue yellows and would gladly do anything to help the cause of the yellows. Contreras bared that it was on record that NoyNoy Aquino was the one who has a psychological disorder as stated on his records with Ateneo de Manila yet he was not asked to undergo a neurological test despite his numerous blunders as a president. Additionally, Contreras said that the Monsods are grateful to the Aquinos for giving the NEDA chairmanship to Winnie during the Cory administration and the COMELEC chairmanship to her husband. It is just normal for them to be loyal to their friends, at the expense of criticizing someone who they think is detrimental to the ascent of the Aquinos or the party it supports. Talagang tunay na dilaw hanggan sa kailaliman ng buto itong si Solita Monsod. Bakit si BS Aquino na merong medical report galing sa Ateneo de Manila na may psychological disorder ay hindi ninyo hiningian ng assesment mula sa mga psychiatrists? Ngayon, nagdi-demand ka ng assessment ng mental health ni Pres. Duterte. Alam ng sambayanang Pilipino kung sino kina Pres. Duterte at BS Aquino ang may diperensya sa utak at kung sino ang wala. We, Filipinos know that you and your husband, Christian Monsod are lackeys and personal friends of the Aquinos. You were appointed by Corazon Aquino as NEDA chairman and your husband as Comelec Chairman and one of the framers of the 1987 Aquino constitution. Kaya siyempre, you’ll never bite the hands of your bosses. Solita “Winnie” Monsod bistado ka na. Biased ka sa mga Aquinos kaya you better shut your mouth.